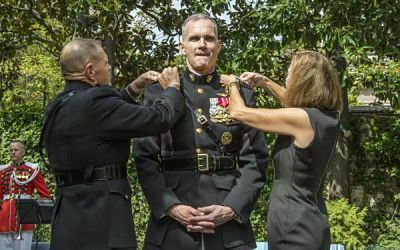 All 2019 General Officer assignments for the Marine Corps, Army, and Air Force. General Officers have a pay grade of O-7 and above. General Officers include Brigadier General (one-star), Major General (two-star), Lieutenant General (three-star), General (four-star). Five-Star ranks are typically reserved for use during war-time. Maj. Gen. William K. Gayler, commanding general, U.S. Army Aviation Center of Excellence and Fort Rucker, Fort Rucker, Alabama, to director, J-3 Operations/Cyber, U.S. Africa Command, Germany. Maj. Gen. David P. Glaser, provost marshal general/commanding general, U.S. Army Criminal Investigation Command, Washington, District of Columbia, to deputy commanding general, U.S. Army North, Joint Base San Antonio, Texas. Maj. Gen. Sean M. Jenkins, chief, Office of Security Cooperation-Iraq, Iraq, to commander, Joint Enabling Capabilities Command, U.S. Transportation Command, Suffolk, Virginia. Maj. Gen. Richard G. Kaiser, commanding general, Mississippi Valley Division, U.S. Army Corps of Engineers, Vicksburg, Mississippi, to deputy chief of engineers/deputy commanding general, U.S. Army Corps of Engineers, Washington, District of Columbia. Maj. Gen. Erik C. Peterson, commanding general, First Army Division West, Fort Hood, Texas, to director, Force Development, Office of the Deputy Chief of Staff, G-8, U.S. Army, Washington, District of Columbia. Maj. Gen. John P. Sullivan, assistant deputy chief of staff, G-4, U.S. Army, Washington, District of Columbia, to commanding general, 1st Sustainment Command (Theater), Fort Knox, Kentucky. Maj. Gen. Frank W. Tate, senior advisor to the Ministry of Defense, U.S. Forces-Afghanistan, Operation Freedom’s Sentinel, Afghanistan, to commanding general, First Army Division West, Fort Hood, Texas. Maj. Gen. Richard M. Toy, commanding general, Great Lakes and Ohio River Division, U.S. Army Corps of Engineers, Cincinnati, Ohio, to commanding general, Mississippi Valley Division, U.S. Army Corps of Engineers, Vicksburg, Mississippi. Maj. Gen. Daniel R. Walrath, deputy chief of staff, Operations, Resolute Support Mission, North Atlantic Treaty Organization/U.S. Forces-Afghanistan, Operation Freedom’s Sentinel, Afghanistan, to commanding general, U.S. Army South, Joint Base San Antonio, Texas. Maj. Gen. Michael C. Wehr, deputy chief of engineers/deputy commanding general, U.S. Army Corps of Engineers, Washington, District of Columbia, to director, Strategy, Capabilities, Policy, Programs, and Logistics, U.S. Transportation Command, Scott Air Force Base, Illinois. Brig. Gen. (Promotable) Karl H. Gingrich, director, Capability and Resource Integration, J-8, U.S. Cyber Command, Fort Meade, Maryland, to director, Program Analysis and Evaluation, Office of the Deputy Chief of Staff, G-8, U.S. Army, Washington, District of Columbia. Brig. Gen. William M. Boruff, commanding general, Mission and Installation Contracting Command, Joint Base San Antonio, Texas, to deputy commanding general, U.S. Army Contracting Command, Redstone Arsenal, Alabama. Brig. Gen. Michael R. Eastman, deputy director for Operations, National Joint Operations Intelligence Center, Operations Team Four, J-3, Joint Staff, Washington, District of Columbia, to deputy director for Future Joint Force Development, J-7, Joint Staff, Washington, District of Columbia. Brig. Gen. David J. Francis, director, Army Aviation, Office of the Deputy Chief of Staff, G-3/5/7, U.S. Army, Washington, District of Columbia, to commanding general, U.S. Army Aviation Center of Excellence and Fort Rucker, Fort Rucker, Alabama. Brig. Gen. Paul H. Fredenburgh III, director of Command, Control, Communications and Cyber, J-6, U.S. Indo-Pacific Command, Camp Smith, Hawaii, to deputy commander, Joint Force Headquarters–Department of Defense Information Networks, Defense Information Systems Agency, Fort Meade, Maryland. Brig. Gen. Brett T. Funck, deputy chief of staff, G-3/5/7, U.S. Army Reserve Command, Fort Bragg, North Carolina, to deputy commanding general, 10th Mountain Division (Light), Fort Drum, New York. Brig. Gen. Brian W. Gibson, commandant, U.S. Army Air Defense Artillery School, U.S. Army Fires Center of Excellence, Fort Sill, Oklahoma, to director, Air and Missile Defense Cross Functional Team, Fort Sill, Oklahoma. Brig. Gen. Anthony R. Hale, deputy, Deputy Chief of Staff, Intelligence, Resolute Support Mission, North Atlantic Treaty Organization/Deputy Director, Operations and Support, J-2, U.S. Forces-Afghanistan, Operation Freedom’s Sentinel, Afghanistan, to director of Intelligence, J-2, U.S. Special Operations Command, MacDill Air Force Base, Florida. Brig. Gen. Lonnie G. Hibbard, deputy chief of staff, G-3/5/7, U.S. Army Training and Doctrine Command, Joint Base Langley-Eustis, Virginia, to commanding general, U.S. Army Center for Initial Military Training, U.S. Army Training and Doctrine Command, Joint Base Langley-Eustis, Virginia. Brig. Gen. Jonathan E. Howerton, deputy chief of staff, G-3/5/7, U.S. Army Pacific, Fort Shafter, Hawaii, to chief of staff, U.S. Army Pacific, Fort Shafter, Hawaii. Brig. Gen. John D. Kline, deputy commanding general (Support), 7th Infantry Division, Joint Base Lewis-McChord, Washington, to deputy chief of staff, G-3/5/7, U.S. Army Training and Doctrine Command, Joint Base Langley-Eustis, Virginia. Brig. Gen. Christopher C. LaNeve, commanding general, 7th Army Training Command, U.S. Army Europe, Germany, to director, Operations, Readiness and Mobilization, Office of the Deputy Chief of Staff, G-3/5/7, U.S. Army, Washington, District of Columbia. Brig. Gen. Otto K. Liller, deputy commander, Special Operations Joint Task Force-Afghanistan, Operation Freedom’s Sentinel, Afghanistan, to commander, Special Operations Command-Korea, U.S. Special Operations Command, Republic of Korea. Brig. Gen. Stephen J. Maranian, deputy commanding general (Maneuver), 2d Infantry Division (Combined), Eighth Army, Republic of Korea, to deputy commanding general, U.S. Army Combined Arms Center, Fort Leavenworth, Kansas. Brig. Gen. Michael C. McCurry II, deputy commanding general (Support), 2d Infantry Division (Combined), Eighth Army, Republic of Korea, to director, Army Aviation, Office of the Deputy Chief of Staff, G-3/5/7, U.S. Army, Washington, District of Columbia. Brig. Gen. James S. Moore Jr., commanding general, 593d Sustainment Command (Expeditionary), Joint Base Lewis-McChord, Washington, to director of Readiness, Strategy, and Operations, Office of the Deputy Chief of Staff, G-4, U.S. Army, Washington, District of Columbia. Brig. Gen. Scott M. Naumann, deputy commanding general (Support), 1st Armored Division, Fort Bliss, Texas, to chief of ftaff, III Corps, Fort Hood, Texas. Brig. Gen. Christopher R. Norrie, deputy commanding general (Maneuver), 1st Cavalry Division, Fort Hood, Texas, to commanding general, 7th Army Training Command, U.S. Army Europe, Germany. Brig. Gen. John B. Richardson IV, director, Operations, Readiness and Mobilization, Office of the Deputy Chief of Staff, G-3/5/7, U.S. Army, Washington, District of Columbia, to deputy chief of staff, G-3/5/7, U.S. Army Forces Command, Fort Bragg, North Carolina. Brig. Gen. Michel M. Russell Sr., commanding general, 19th Sustainment Command (Expeditionary), Eighth Army, Republic of Korea, to assistant deputy chief of staff, G-4, U.S. Army, Washington, District Of Columbia. Brig. Gen. Michelle A. Schmidt, director of Intelligence, J-2, U.S. Special Operations Command, MacDill Air Force Base, Florida, to deputy commanding general, 10th Mountain Division (Light), Fort Drum, New York. Brig. Gen. Mark T. Simerly, commander, Defense Logistics Agency Troop Support, Defense Logistics Agency, Philadelphia, Pennsylvania, to commanding general, 19th Sustainment Command (Expeditionary), Eighth Army, Republic of Korea. Brig. Gen. William D. Taylor, commanding general, U.S. Army Operational Test Command, Fort Hood, Texas, to senior advisor to the Ministry of Defense, U.S. Forces-Afghanistan, Operation Freedom’s Sentinel, Afghanistan. Brig. Gen. William L. Thigpen, deputy commanding general, 4th Infantry Division, Fort Carson, Colorado, to deputy director for Operations, National Joint Operations Intelligence Center, Operations Team Four, J-3, Joint Staff, Washington, District of Columbia. Brig. Gen. John C. Ulrich, director, Force Development, Office of the Deputy Chief of Staff, G-8, U.S. Army, Washington, District of Columbia, to director, Capability and Resource Integration, J-8, U.S. Cyber Command, Fort Meade, Maryland. Brig. Gen. Kevin Vereen, deputy commanding general, U.S. Army Recruiting Command, Fort Knox, Kentucky, to provost marshal general/commanding general, U.S. Army Criminal Investigation Command, Washington, District of Columbia. Brig. Gen. Robert F. Whittle Jr., commandant, U.S. Army Engineer School, U.S. Army Maneuver Support Center of Excellence, Fort Leonard Wood, Missouri, to commanding general, Great Lakes and Ohio River Division, U.S. Army Corps of Engineers, Cincinnati, Ohio. Col. (Promotable) Christine A. Beeler, deputy commander, U.S. Army Contracting Command, Redstone Arsenal, Alabama, to commander, Mission and Installation Contracting Command, Joint Base San Antonio, Texas. Col. (Promotable) Robert M. Collins, assistant program executive officer, Intelligence, Electronic Warfare and Sensors, Aberdeen Proving Ground, Maryland, to program executive officer, Intelligence, Electronic Warfare and Sensors, Aberdeen Proving Ground, Maryland. Col. (Promotable) Gavin A. Lawrence, director of Readiness, Strategy, and Operations, Office of the Deputy Chief of Staff, G-4, U.S. Army, Washington, District of Columbia, to commander, Defense Logistics Agency Troop Support, Defense Logistics Agency, Philadelphia, Pennsylvania. Col. (Promotable) Kevin C. Leahy, deputy commander, Special Operations Command Central, U.S. Central Command, Tampa, Florida, to deputy commander, 7th Infantry Division, Joint Base Lewis-McChord, Washington. Col. (Promotable) Mark C. Quander, commander, Transatlantic Division, U.S. Army Corps of Engineers, Winchester, Virginia, to commandant, U.S. Army Engineer School, U.S. Army Maneuver Support Center of Excellence, Fort Leonard Wood, Missouri. Col. (Promotable) Brett G. Sylvia, chief of staff, III Corps, Fort Hood, Texas, to deputy commander, 1st Cavalry Division, Fort Hood, Texas. Brig. Gen. Christopher T. Donahue, deputy director for special operations and counterterrorism, J-3, Joint Staff, Washington, District of Columbia, to commander, Special Operations Joint Task Force-Afghanistan, U.S. Forces-Afghanistan; and Special Operations Component Command-Afghanistan, Resolute Support Mission, Operation Freedom’s Sentinel, Afghanistan.